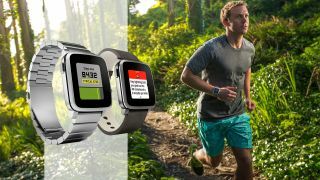 Wearable makers are finally realizing that activity tracking is a huge selling point for consumers, and to that end smartwatch maker Pebble has updated its devices to get smarter about fitness. A slew of updates arrives today on Pebble Health, the company's fitness tracking app for Android and iOS. The app launched back in December, but lacked features users came to expect from dedicated fitness trackers. With today's improvements, Pebble is setting its sights squarely on Fitbit. Pebble Health now shows users a comprehensive look into fitness and sleep activity. Users can compare activity over the last day, week and month. The app also shows calories burned, step distance, and active time. Pebble smartwatches, like the Time and Time Round, are getting a software update as well. They can now detect whether you're running or walking, and will display detailed data within the smartphone app. For those who can sleep with a watch on their wrist (I can't), Pebble Health will help you find your ideal wake time by gently waking you up when you're at your lightest sleep. This translates to your Pebble waking you up as much as 30 minutes before your scheduled alarm. It seems a bit strange at first, but the feature aims to maximize your day and prevent you from snoozing. Last but not least, the Pebble Health app will present data in a smarter way as well as offering up encouraging messages to keep you on track. You'll receive notifications about historical data to urge you to keep doing what you're doing, or step it up if you've been falling behind. On top of the massive health update, Pebble released a a smartwatch update to make messaging a little more useful for iPhone users. The Send Text app now lets you start a conversation from your wrist, and users can also send canned responses or record a voice message. Android users have enjoyed these features for a while now, and Pebble isn't pulling any punches when calling out Apple for its lack of a Messages API. "We encourage Pebble users to let Apple know that they would like to see an iOS Messages API, so that we can provide a more universal solution that integrates Pebble replies with iPhone's iMessages app," said Pebble. Pebble was using a workaround by partnering with carriers to bring voice and text replies to iPhone users. The workaround did have its limitations, like not having a history of sent messages since Pebble can't tap into the iMessages app. Today's update helps bring iPhone users up to speed with what Android owners can to do, but it's clear Pebble still isn't happy with iOS's limitations.